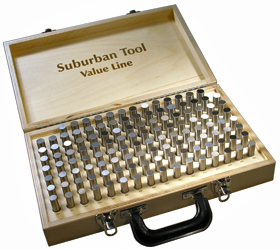 ï»¿ Value Line Gage Pin Sets from Suburban Tool, Inc.
All pins are 2" long with sharp corners broken. Size is clearly etched on each pin. Gage pins are supplied in 0.001" increments. Sets are supplied in a custom fitted wooden case.